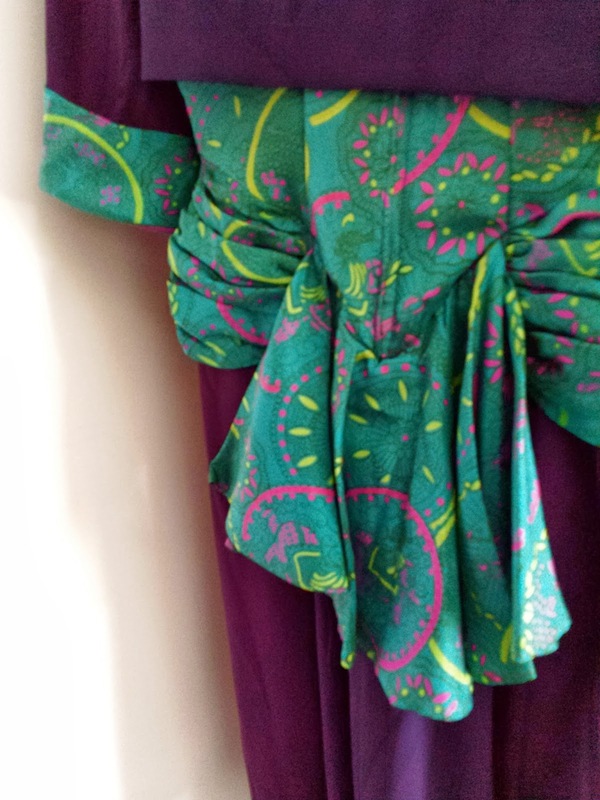 Okay, I am super pumped about how my first Sew For Victory 2014 project, the Vogue robe, is going. (You can find more details about it here.) I am 98% done with adding some special fanciness to it, then all I have to do is put the main pieces together and add some buttons! It's looking pretty great, although I did realize the other day (when it was brought to my attention by one of my fiancé's friends) that it does resemble a "Lord of the Rings" elvish garment a bit.... but I think I'm okay with that! Also, I am a part of the Sew For Victory Flickr group, my profile is here, and I highly recommend it! It really helps add to the inspiration and sense of comradery. Also, just to warn you, there will be fewer posts in April than I have usually been doing. I graduate from uni on May 3, get married on May 10, and before then I plan on getting my schoolwork done, finishing strong as a Resident Assistant in my dorm, moving my things into a house, and getting a "real" job. It's kind of a lot to handle, so blogging is taking a bit of a back seat spot during this month of my life. However, in May or June I plan on doing some pretty radical changes to the blog and reopening my Etsy shop, so stick with me and hold out until then! I'm super excited about these ideas I have to postpone until after major life events, and it's nearly killing me to have to wait! 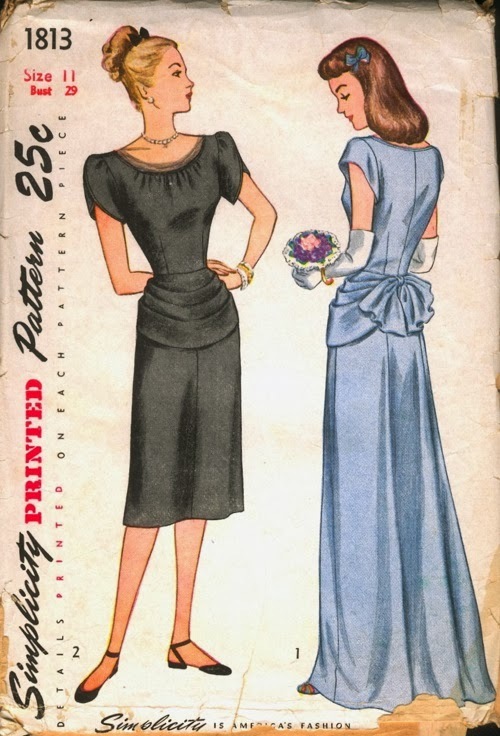 First up I have a pattern I recently bought for a special occasion coming up. I'm not going to tell you what it is, but it's in May. Hint hint. I am going to use some brown fabric from my stash (I bought it from a thrift store, so I'm not sure what kind it is exactly. I'm actually confused by it. It's fairly thin, but opaque, and has texture and a fairly heavy drape. 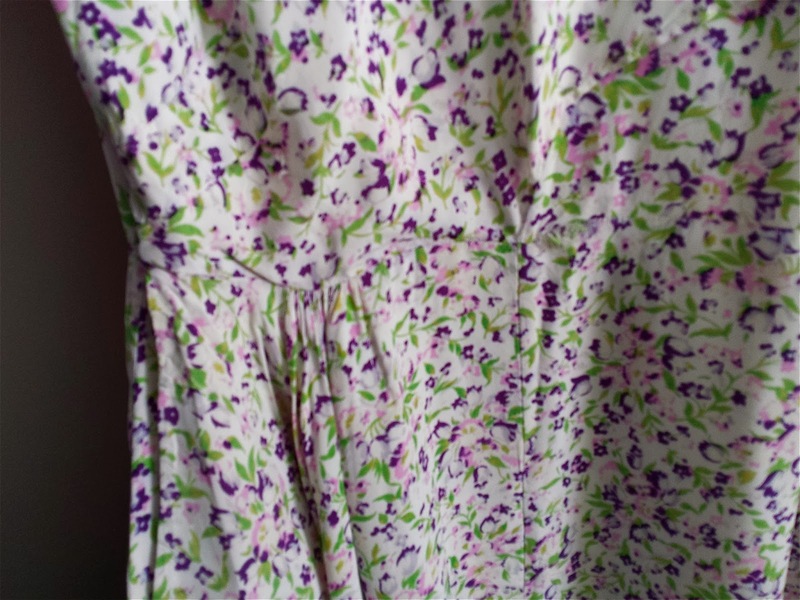 Sort of like a heavy rayon feel, but I don't think it's rayon). 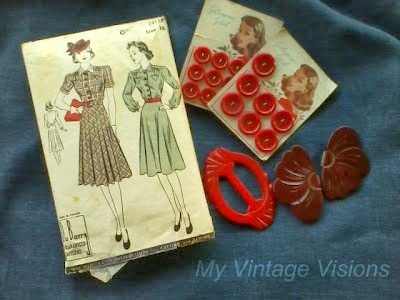 I also have these cute retro buttons that I think will make a nice statement detail on the outfit, for I'm going to make both the sundress and the long-sleeved version of the suit jacket. 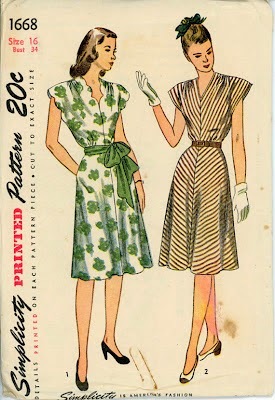 I'm very surprised at how fabric-efficient this pattern is (huzzah 40s rationing! ), and I'll let you know about all the details when I finish it! I'm really using this project as a wearable muslin for an upcoming version that is more important. The patterns don't come with a lot of instructions and I haven't done any princess-seamed garments before, so hopefully it all turns out well! 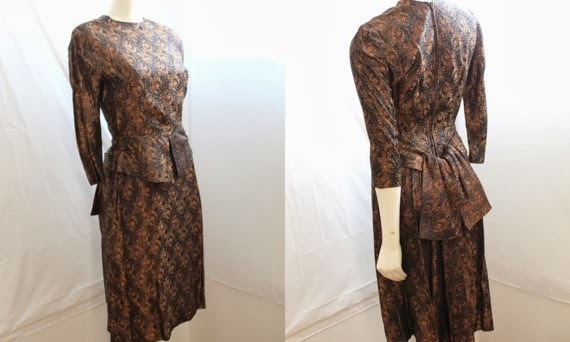 Although this robe pattern is probably from the late 1940s (maybe early 1950s?) I'm going to make it more 40s-ish is by adding shoulder pads for a more defined shoulder. I'm using a green panne velvet to create the full-length version. I will be changing the sleeves a little bit and adding the shoulder pads, but otherwise I'm going to do everything according the the pattern. I'm also going to line the thinner velvet with a gray flannel to make it cozier! P.S. 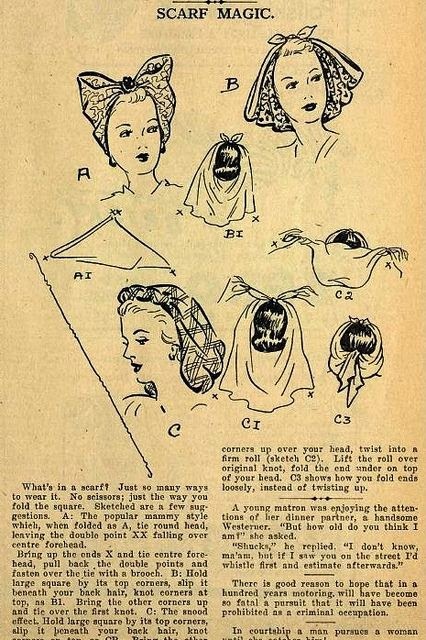 I'm not sure what the Asian hat is about on the pattern cover. "Why yes, of course I always wear this hat with my robe. Obviously they go together." What is that about, 1940s? So what about you guys? Do you have your projects picked out and ready to go yet? Have you posted about them somewhere? If so, leave your link so I can go read the deets on your SFV goals this year! For those of you that haven't heard, the annual "Sew For Victory!" challenge is currently underway until April 30th! 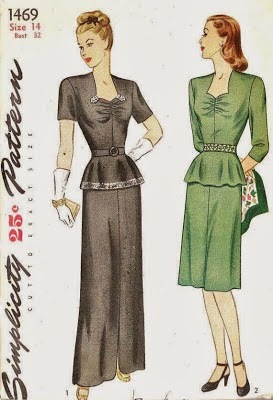 It's a non-competitive challenge to create a 1940s appropriate garment all on your own, and I will be joining this year! This page will explain everything, and there's a Flickr group to join as well to keep up to date on everyone's project progress! 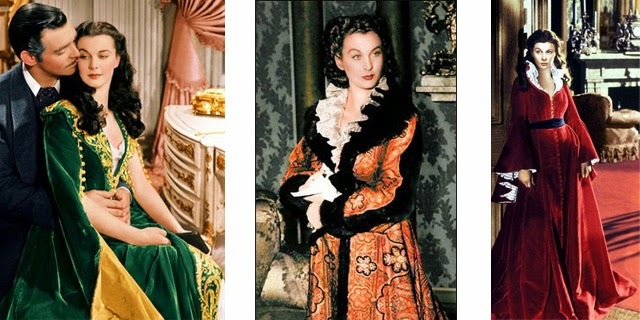 Now when I get inspirations for such projects that involve vintage sewing, I do as much research as I can on a pattern before I begin. 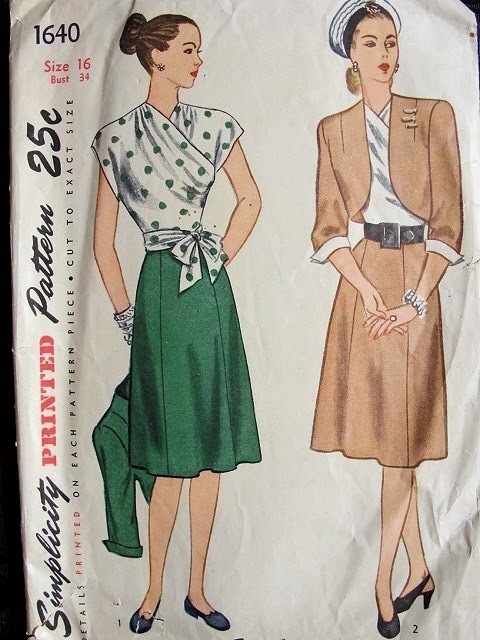 I search to see if anyone else has done the pattern and talked about it online, and I look at magazines and fashion ads that show trends of the time to find ways to customize the pattern for myself if I'd like. Although pattern illustrations are helpful, I really prefer to see the garments in real life because sometimes they can differ a lot from the pattern drawings! 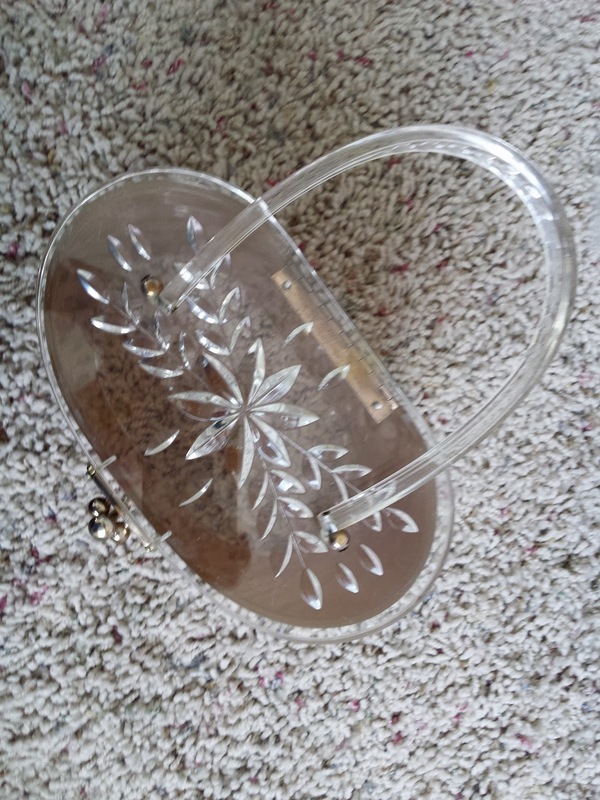 I encourage you to hop on over to Emily's Vintage Visions! She has lots of other posts as well on everything from reenactments to historical stays to... well, she's got a great variety on all things historical and vintage! Go check it out! You know those times when you try something new with your wardrobe, and you stare in the mirror a few times that day trying to figure out whether it's new and innovative or just straight up weird? This outfit has been one of those for me. My scarf is quite a bit larger though, so it's a little different. But what do you think? I'm really torn. Do you think it works as a fun accessory, or is it strange? Does it even look vintage? I'm divided. 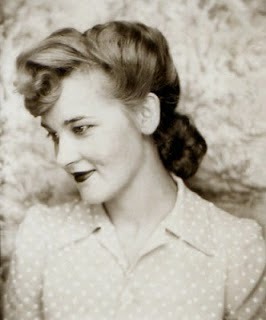 Following the 1940s Working Woman Series, I have been on a bit of a hiatus for a few days while I've been on Spring Break! I am still on break until Sunday, and I'm spending the week in Michigan with my family, sister, and fiancé at my grandparents' house. It has been a great time of chilling and relaxing, and we've also done a bit of shopping, too! 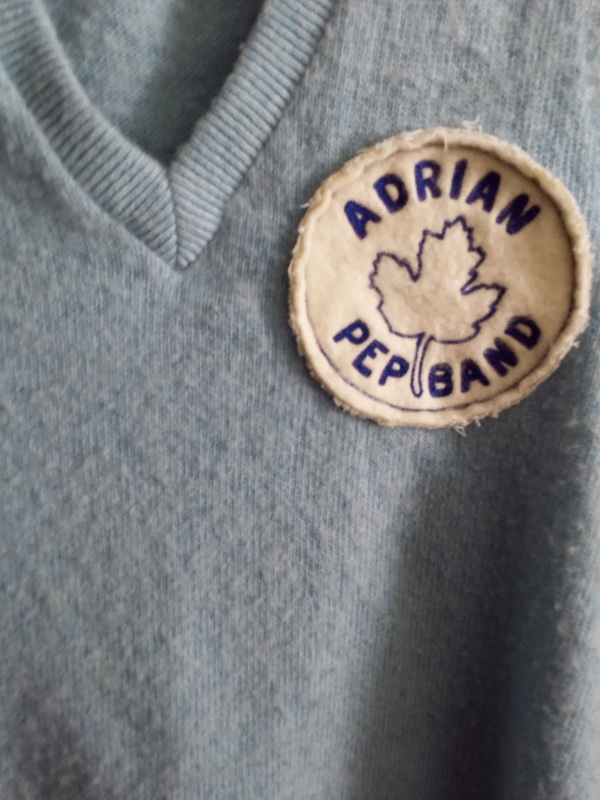 My grandma is queen of deals and sales, and she ran across an estate sale of an elderly lady who apparently was near my size and had tiny feet! The prices were incredible, and we got quite a few items I'll be showing soon! 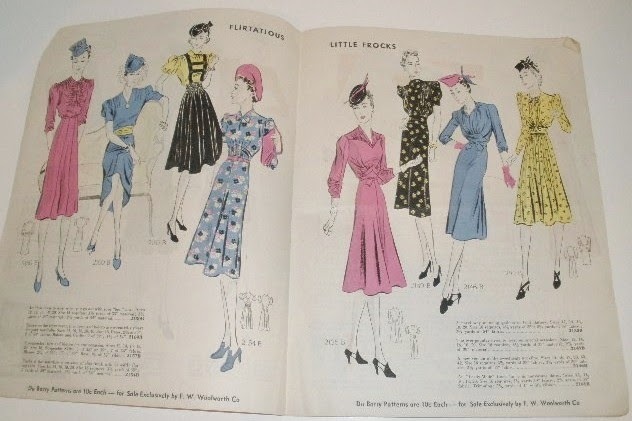 Then, later that day after eating at a lovely fancy-schmancy tea house, we went to a giant flea market in a neighboring town, and I scored on a few 1940s and 50s dresses for incredible prices! One of them, the one pictured above, I am especially intrigued by. I'm hoping to do some research about it and share what I find with all of you soon. Until I can post more, here are some phone pic sneak peeks to some items I'll be sharing in the days to come!